Sitting right at the border between the greater Washington and Baltimore Metropolitan Areas, Davidsonville, Maryland is sometimes referred to as an “exurb,” a community that combines long-distance commuters with active farms and a few businesses that serve the travelers that pass along the crossroads at the center of the community. Davidsonville doesn’t have much in the way of water or sewage systems, so instead residents rely on septic tanks and wells. And while these systems have built-in safeguards, they can potentially cause water damage to homes if they fail. A flood doesn’t have to reach the roof of a house or carry a building right off its foundations to cause some serious harm. It doesn’t take much water to start a leak that gets into your basement or soaks into the ground beneath your foundation crawlspace. Septic water is especially bad news, and not just because of the smell: it’s also because it’s full of nutrients that allow all kinds of mold, bacteria, and pest animals to grow and thrive in a short amount of time. Even clean well water will cause a mold outbreak thanks to the nutrients it picks up from the dirt along with the organic materials like hair and skin flakes in ordinary dust. Mold spores are always around us, and you’re breathing them in even as you read this. The reason you probably haven’t notices is because there aren’t too many spores in the air and your lungs are designed to safely get rid of them without any hassle. But because they’re everywhere, mold colonies are almost always the first things to spring up whenever water gets into your house, no matter how that water gets in. The fact that water and mold are so connected is why AA Action Waterproofing offers mold remediation in Davidsonville, along with every other community in and around Baltimore and throughout the state of Maryland. We even offer our services to neighboring states like Virginia, New Jersey, and Pennsylvania. We don’t just cover flood and overflow damage, either. Along with mold remediation in Davidsonville, Annapolis, and the rest of the Chesapeake Bay Area, we also provide preventive waterproofing and basement repair services. These include construction and remodeling consultations, foundation repair and replacement, and waterproofing troubleshooting for when you know you have a problem but you can’t identify what. The remediation process is always a bit different in every case. The basic idea is the same, but every home and every plot of land is unique, plus every mold infestation has its own characteristics. This means that every mold remediation in Davidsonville homes has to be personalized to the individual problem. In the first place, the flow of water needs to stop. If the problem is a broken or leaking pipe system or an overflowing septic tank, you’ll need to repair it before doing anything else. This also means fixing other potential water problems like foundation cracks, clogged gutter systems that spill rainwater too close to the house, and even a dehumidifier in the basement because the humidity of a Maryland summer can sometimes be enough to cause a mold outbreak. The next step of a mold remediation in Davidsonville or any other part of Maryland is to seal off the affected area. This keeps all the extra mold spores from spreading throughout the house, lowering the air quality and making it more likely that another outbreak will strike in another part of the house. After that comes the cleaning and drying process. 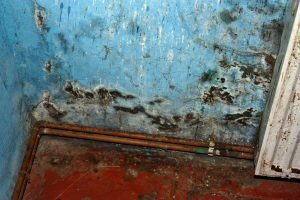 Mold can grow on any surface that’s rough and porous enough, and so while no species can eat concrete or fiberglass insulation, they can still grow there with enough water and nutrients. They can even eat away at concrete by creating an acid that breaks down the binding cement. Because of this, mold remediation can sometimes mean cutting out compromised parts of the building and replacing them. If you need a mold remediation in Davidsonville, Baltimore, Washington, or any other community in or around the state of Maryland, you should contact AA Action Waterproofing today. Our first estimate is always free and carries no obligation, and although we’ve been in business for three decades, we’ve never met a mold problem we couldn’t handle.